We are proud to have been honored for the second year in a row, To be considered for and to receive this award again says a lot about our products, our commitment to the manufactured housing industry, and how we take care of our customers. 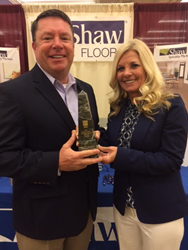 For the second consecutive year, Shaw Industries’ Specialty Markets Division has been named Supplier of the Year by the Manufactured Housing Institute (MHI). Shaw Specialty Markets provides flooring to the manufactured housing industry. The award, which was presented during the 2016 National Congress and Expo for Manufactured and Modular Housing, was the second win for Shaw. MHI is the national trade organization representing all segments of the factory-built housing industry. The award is open to any supplier to the manufactured housing industry. It was voted on by all manufacturers who are members of MHI. Service, sales coverage, breadth of product line, styling, and quality were all factors taken into account for the award.